The dishes were piled high, creating a mess that matched the rest of the house, and I needed to eat the lunch I had missed with the rest of the family, but some how I found myself offering to pull out the math craft I'd been promising my daughter. I explained that we needed to make four snowflakes, and her eyes lit up. "You make two and I'll make two." So we did. 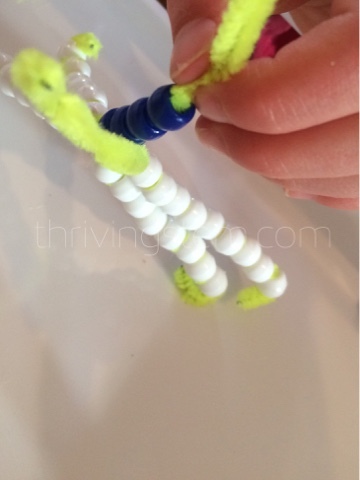 This craft will help your children understand addition as puytting together and adding to, and subtraction as taking apart and taking from. 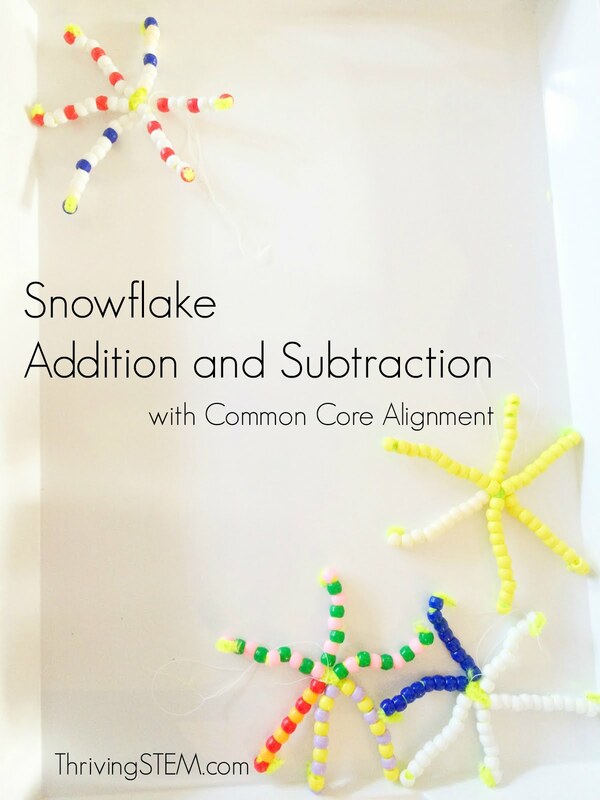 It addresses Common Core Math objectives K.OAA.1,2,3, Particularly adressing decomposition of the number six. If you are presenting this to an entire class, you may want to divide the children into groups of four. Tell them that each group member needs to make a different number of alike and different, and let them figure out who is doing what. If that's beyond their abilities, assign each group member a number between zero and three. Twist three of the halves together in the middle to form each snow flake. 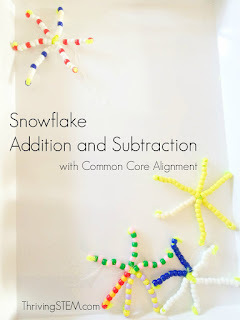 You might like to start by showing the children pictures of snow flakes and asking them to count the sides. Tell them that every snow flake that has ever been seen has six sides. I just told my daughter that all snow flakes have six sides. Of course, she asked how I knew, and I was forced to go back and amend my universal statement. The mechanics are simple. 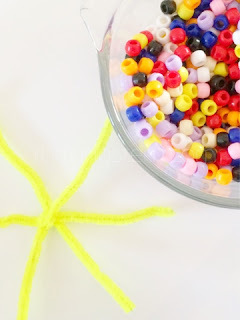 Thread the beads onto the sides of the snowflake. Repeat for a set number, in this case, two. Since the goal of this craft is to practice recognizing what numbers pair to make six, be sure not to tell your students what the pairs are. Instead, tell them to choose a design for two sides that match, and make the rest different. Then, ask how many will be different. 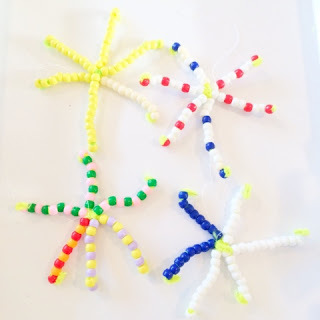 We repeated this process for each snowflake. She surprised me by choosing "1+2" to pair with 3. That worked for my purpose, but you can dictate that "all the rest" have to match if you just want addend pairs. She also opted for a second 2+4 combination. My intention was to do one each of 6+0, 5+1, 4+2, and 3+3. Aren't these fun? We were both really pleased with the results. 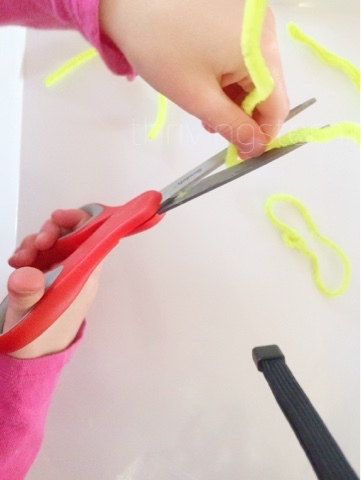 She is going to use them as decorations in her room. 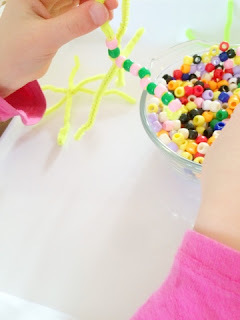 You probably have more on your plate than you care to think about right now, but you won't regret stopping to do a beautiful activity the children love. And just because it's fun doesn't mean they aren't learning. As I write, my daughter is happily asleep, and those dishes are still in need of some attention. So, I will leave you to your crafting, and while I take care of them. 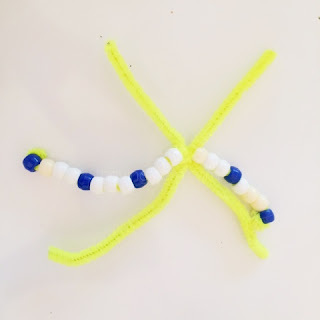 The Kindergarten Blogging Team has a fantastic list of icy learning activities. I'm sure you can find a few things to use with your own students. 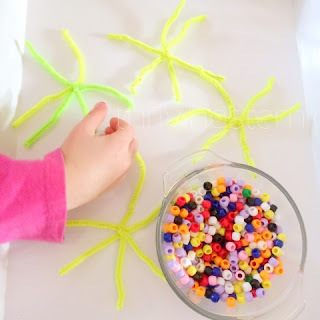 What a great way to combine math, crafts and fine motor skills!